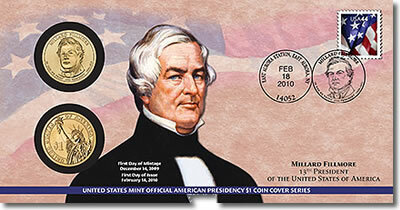 Millard Fillmore Presidential $1 Coin Covers were issued by the United States Mint today, April 2, 2010. The limited-edition product is the first one released this year in the American Presidency $1 Coin Cover Series and the 13th since they began in 2007. Each is priced at $15.95, which is $1 more than past issues. A maximum of 32,000 will be produced, which is 8,000 less than older covers. These covers include two Millard Fillmore Presidential dollars that were struck on the first day of minting and are mounted on a display card. One dollar is from the Mint’s Denver facility and the other is from Philadelphia. Both were produced on December 14, 2009. In addition to the two $1 coins, the display card includes a 44-cent Flag postage stamp with a postmark of February 18, 2010, East Aurora, NY, which is when the very first dollars were released into circulation. 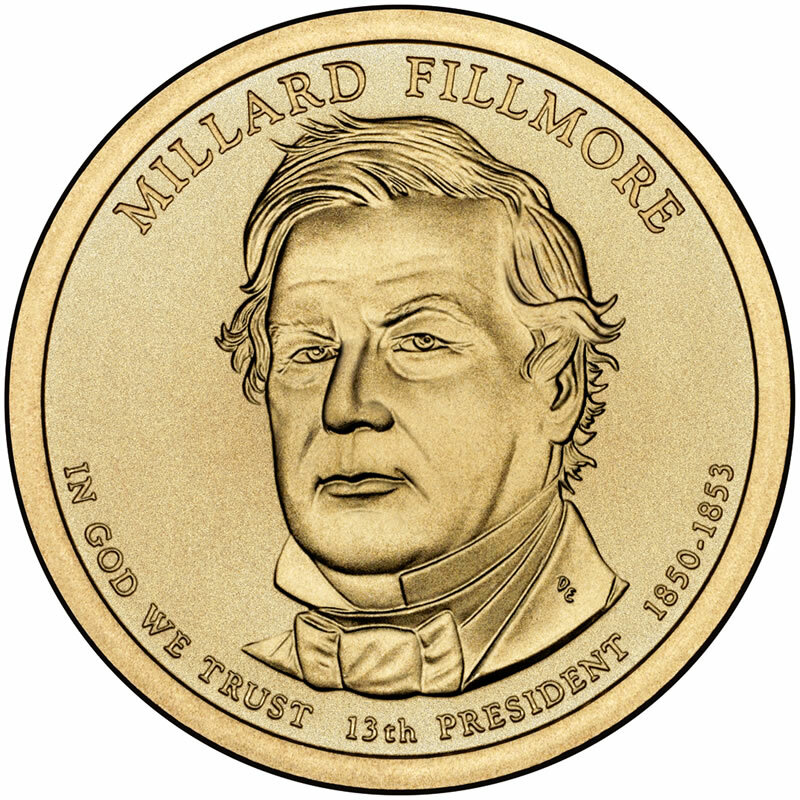 Don Everhart designed and sculpted the portrait of Millard Fillmore that is featured on the obverse or heads side of the coin. It also includes the inscriptions "MILLARD FILLMORE," "IN GOD WE TRUST," "13TH PRESIDENT" and "1850-1853,". Fillmore was born only five miles east of Moravia. He served as the 13th President of the United States from 1850-1853 after assuming the office when President Zachary Taylor passed away. These were tremulous times for the country which was already on the verge of a civil war, postponed by the Compromise of 1850. Fillmore is credited with the 1854 Treaty of Kanagawa effectively ending the isolationism of Japan. The first four Presidential Dollars issued in 2007 had the image of George Washington, John Adams, Thomas Jefferson and James Madison. The next four $1 coins released in 2008 honored James Monroe, John Quincy Adams, Andrew Jackson and Martin Van Buren. The 2009 coins featured William Henry Harrison, John Tyler, James K. Polk and John Tyler. A $4.95 shipping and handling charge will be added. No household order limits are in place. The covers may also be purchased through the Mint’s toll-free number, 1-800-USA-MINT (872-6468). Hearing and speech-impaired customers may order by calling 1-888-321-MINT (6468). Rolls of the dollars are available directly from the Mint as well. 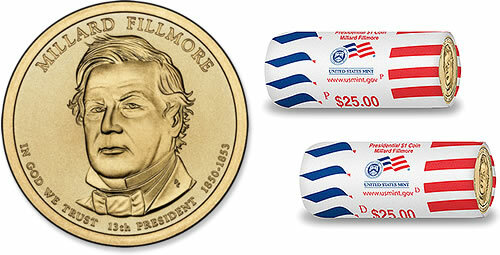 They are available through specially Mint-wrapped $25 rolls containing either Denver or Philadelphia minted dollars for a price of $35.95, plus shipping and handling.